Let’s have a look at how alcohol affects the body as (although I’m not advocating drinking! ), it isn’t dubbed the ‘silly season’ for no reason. 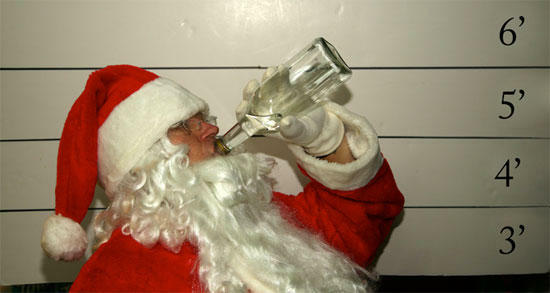 Alcohol consumption generally increases over Christmas and this can wreak havoc with our health if we’re not careful. From the moment an alcoholic drink enters the body, it’s treated as if it has special privileges – receiving priority treatment and getting absorbed and metabolised before most nutrients. You see, unlike food which requires time for digestion, alcohol needs no digestion and is quickly absorbed…about 20 percent is absorbed directly across the walls of an empty stomach and can reach the brain within a minute! As the presence of food in the stomach brings about a slower absorption of alcohol into the bloodstream, it is advisable to eat a decent meal before you head out, ideally including carbohydrates, protein and healthy fats such as olive oil. While alcohol affects every organ in the body, the most dramatic evidence of its disruptive behavior appears in the liver. If the liver could talk, it would describe alcohol as ‘demanding’, ‘egocentric’, and ‘disruptive’ of the livers efficient way of running its business. How inconsiderate! If more alcohol arrives at the liver than the enzymes can handle, the extra alcohol travels to all parts of the body, circulating again and again until liver enzymes are finally able to process it. This is why it’s important to drink slowly enough for the liver to keep up – never more than one drink per hour or you could be facing a nasty hangover if your body couldn’t keep up with processing the toxins! Physical symptoms felt during a hangover are numerous and varied from one person to another – in general they include persistent headaches, mental fogginess, dehydration and sometimes nausea. Usually, the best remedy includes rest and rehydration. Drinking a large glass of water before going to bed can help ‘take the edge off’ the morning after. Hangovers are intensified if the person was smoking while drinking, as cigarette smoke adds many additional toxins and furthers the processes of dehydration already developing in the person. Abstinence is the best course for those who can’t control their drinking. Although not a cure, various supplements may help heavy drinkers overcome their craving for alcohol, support them during the taxing withdrawal period and set them on the road to recovery. An intense physical and psychological dependence on alcohol is the hallmark of alcoholism – which many consider a chronic disease, like diabetes or hypertension. Though alcohol in moderation appears to protect the heart, excessive drinking over time can damage the liver, pancreas, intestine, brain and other organs. It can also cause malnutrition when empty alcohol kilojoules replace a nourishing diet. Drinking has a social component; it makes most people feel talkative and relaxed. Precisely why some people pursue alcohol to excess remains a mystery. Psycho-social factors play a role, but there seems to be strong genetic component as well; indeed children of alcoholics are at high risk of developing the disease, even when they are raised in non-drinking households. Constantly seeking opportunities to drink; being unable to cut intake; putting alcohol before family, friends and work. Needing more and more alcohol to achieve the same effect. Reacting indignantly to criticism of drinking; adamantly denying the problem. Experiencing withdrawal signs (tremours, seizures and hallucinations) if drinking is stopped. Most heavy drinkers are deficient in important nutrients, including B vitamins, vitamin C and amino acids (protein), as they don’t have a healthy diet and of alcohols toxic effects. It may be beneficial to continue therapy for several months or more to help restore depleted nutrients. Vitamin C can help to strengthen the body during this difficult period, clearing alcohol from the tissues and ameliorating mild withdrawal symptoms; it is most useful when taken with vitamin E.
The B-complex vitamins, the amino acid glutamine and kudzu vine extracts (from Chinese herbalists) appear to reduce the craving. Take extra thiamine as well to ease withdrawal symptoms. The herb milk thistle and phosphatidylcholine (500 mg three times a day) strengthen the liver, helping it to rid the body of toxins. The mineral chromium should be taken to prevent cravings caused by low blood sugar (hypoglycaemia), a common problem in alcoholics. Evening primrose oil provides the fatty acid GLA (gamma-linolenic acid); this substance stimulates production of a brain chemical called prostaglandin E, which works to prevent withdrawal symptoms such as seizures and depression. It also helps to protect the liver and nervous system. The herbs kava and valerian are both natural sedatives. Join a support group, such as Alcoholics Anonymous (AA). Try acupuncture: it may reduce the craving for alcohol. The kudzu vine (Pueraria lobata) is sometimes called ‘nature’s Anti-abuse’ after the well-known prescription addiction fighter (disulfiram). In Australia it’s known as Japanese arrowroot and is found in tropical New South Wales.